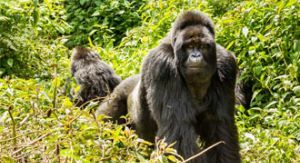 Travel to Uganda and Rwanda for one of Africa’s most memorable wildlife encounters: sitting face to face with mountain gorillas in their unspoilt jungle habitat. Habituated to our presence, these gentle forest giants allow us to join their family for an hour. You’ll sit spellbound as you watch familiar dynamics unfold around you – shy babies, wrestling, mischievous teenagers and watchful parents. It’s regarded as the most reliable gorilla trekking in Africa. Expert trackers are sent ahead of your hiking party and you’ll be guided by local naturalists for near certain encounters with gorillas and other primates. Accommodation is in the form of safari camps and lodges, set in forest clearings with all the comfort and convenience you need. Usually included as part of a bigger African itinerary, Uganda and Rwanda both offer gorilla trekking but are quite different travel destinations. Rwanda is best for an ‘in-and-out’ gorilla trek. You can fly into Kigali and transfer to the Volcanoes National Park within a few hours. You’ll be gorilla trekking the next day. Uganda offers not just gorilla trekking but also big game safaris and chimpanzee tracking too. Its national parks are home to classic savannah animals such as elephant, buffalo and lion while its forests are filled with other primates, including habituated chimps. 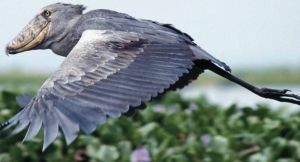 You’ll enjoy game drives and river cruises as well as some of the best bird watching in Africa. 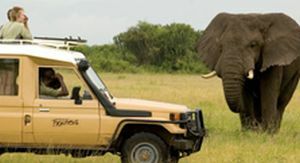 Combine your gorilla trekking adventure with a safari in Kenya or Tanzania for the complete African wildlife experience. You can even add an Indian Ocean beach holiday on as well – the perfect ending. 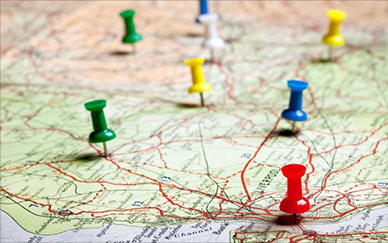 Easy air connections link East Africa’s best destinations and you can even put South Africa, Victoria Falls or Botswana onto your Uganda and Rwanda travel plans – ask us how. Volcanoes National Park, Rwanda – it’s challenging hiking but the reward is an almost guaranteed encounter with mountain gorillas in their rainforest home. 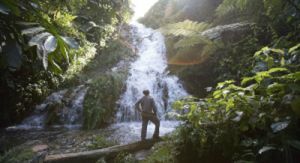 Bwindi Impenetrable Forest, Uganda – a majestic jungle environment that is home to several habituated gorilla families, Bwindi also teems with birds & butterflies. Queen Elizabeth National Park, Uganda – with 600 bird species it’s a birding paradise but also home to animals ranging from tree-climbing lions to chimpanzees. 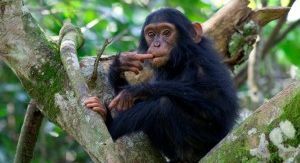 Kibale Forest, Uganda – explore the heart of a tropical forest: expert guides take you in search of chimps, birds & forest animals. 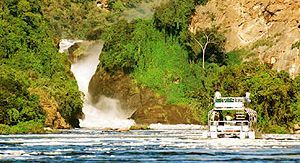 Murchison Falls, Uganda – most famous for its spectacular waterfall, Uganda’s biggest park is also home to big game, chimpanzees & epic bird watching. Sitting with a gorilla family in their natural surroundings is a once-in-a-lifetime experience. Uganda & Rwanda are the best places in Africa to do it. Add on a few days in Uganda’s Queen Elizabeth or Murchison Falls national parks & you’ll enjoy big game viewing as well – elephants, hippos, antelope & Uganda’s famous tree-climbing lions. Uganda’s forests are home to many other primates & several destinations offer chimp tracking adventures. We’d recommend Kibale Forest Reserve, renowned also for its bird watching & dazzling butterflies. One of the best ways to experience Uganda’s big game parks: cruise along Queen Elizabeth’s bird-filled Kazinga Channel or take a trip to see the River Nile thunder over Murchison Falls. With over 600 species to look for, keen birders should add a few days of Uganda travel to their itinerary. Birding hotspots include Kibale Forest & Queen Elizabeth National Park. 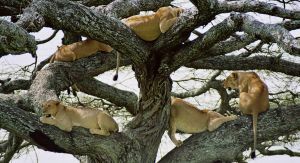 Everyone wants to see lions on safari; at Uganda’s Queen Elizabeth National Park the big cats have taken to climbing trees, offering you unique photo opportunities. 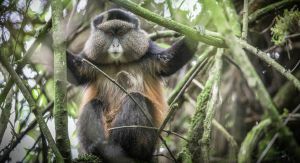 With only a small number remaining in the world, the Golden Monkey can be found in the foothills of the Volcanic Virunga mountains of Mgahinga in Uganda and in the Parc National De Virunga in Rwanda. Uganda & Rwanda are blessed with beautiful ever green forests where different tourism activities like nature walks, waterfall walks or forest walks are conducted.